Please note: This set replaces the former set #2458402 for visual and photographic application of the MPCC Mark III. The old set consisted of a multitude of rings – but was not adjustable in optical length such as this V-1 set. The idea for this new and much more versatile set was born after we received this detailed question regarding eyepiece adaptation on MPCC, where we recommended our VariLock and focusing eyepiece clamp as best accessories. I want to connect my existing EOS T-ring to the Baader MPCC. Does the item on the webpage come with the necessary spacers, or will I have to buy additional items? If you use any standard T-2-ring, you can use the MPCC without any other adapters - the ring will give you the necessary distance of 55mm to the sensor of your DSLR. This is the standard-distance which was also used bei camera lenses with T-2-thread. Only if you have a low-profile T-2-ring like #2408318 or if you use the M48-thread, you'll have to use additional spacer rings. Hi, i purchased your mpcc mkiii, and i would like to know which ring i need to use with a nikon d800? All regular T-rings (but not the low profile adapters) provide the necessary distance of 55mm, which is an industrial standard. I have a m48 t-ring on my d800, do i need to use the badeer m48 extender to compensate the small ring i removed from the coma corrector? Please tell me how can I connect the 2" MPCC Mark III (Multi-Purpose Coma Corrector for Newtons) and the camera QHY 163m. Is there any ready-made solutions. If not, how to calculate the adapter? Thank you. it is quite hard to find data about the back-focus of the QHY 163M camera as their manual is not online, but it seems to be 18mm. The MPCC is designed for a distance of 55mm +/-1mm between its T-2-thread and the sensor, so you need a spacer with a length of 37mm. Please check the camera manual if the back-focus measured from the T-2-thread is 18mm. If it is different, you can use either the Varilock 46 (for 29-46mm) or the VariLock 29 (for 20-29mm). I have purchased a Baader MPCC Multi Purpose Coma Corrector Mark III for use with my Celestron CN-8 f/5 8 inch Newtonian reflector. I am using a Canon 1100D DSLR and standard Canon T-Ring adapter. When these are attached they are then attached to the tube using the Celestron 2 inch eyepiece adapter. The problem I am having is that I cannot get the camera to focus using the MPCC and 2 inch eyepiece adapter. I am at the limit of the telescope focuser which cannot move the camera near enough to the focal point of the telescope. I would have thought that the MPCC/Canon/Celestron combination would be a common one yet it doesn't work. Do you have any suggestions how this could be solved? 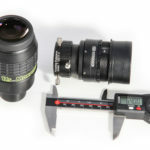 For example, are you aware of a shorter 2 inch eyepiece being available? Is there an attachment that can fit in to the threads at the front/inside of the MPCC which would replace the 2 inch eyepiece and allow the camera sensor to reach the focal point? This is indeed a special case. The Celestron's C8N Newton uses the T-2-thread under the 1.25" adapter to bring the camera close enough to the telescope (a camera requires ca 55mm more back-focus than an eyepiece). But this included T-2-adapter doesn't give you the option to mount any coma corrector in front of it. We do have a S57-ClickLock (Skywatcher / Celestron) #2956257 which should fit into your focuser and is only 30mm long - maybe this saves you enough backfocus, perhaps in combination with moving the main mirror some mm upwards with its collimation screws. On the other hand, we had no reclamations about the MPCC with a Newton concerning focus so far, maybe because most astrographers tend to replace the simple focuser with a better model like the 2" BDS-NT Baader Diamond Steeltrack Focuser # 2957230, anyway. But to mount it onto the C8N, you'd have to drill some holes into the tube, as shown in the installation video on the product site. I'm sorry that Celestron's Newton doesn't provide a possibility to use photographic 2" accessories in a better way. Is the required 55mm distance to the coma corrector measured from the front of the focal reducer or from the location of the CMOS sensor inside the camera housing?. I would like to connect the MPCC Mark III to a ZWO ASI1600MC-Cooled camera that has 6.5mm back focus. Do you sell the necessary spacers to do that? How would I go about using the MPCC Mark III with a Sony A7s (which is a mirrorless DSLR)? Thanks! T2 extension rings will obstruct the image because it is a bottle neck but you have to do a crop down to APS-C at the picture anyway. The Multi Purpose Coma Corrector Mark III eliminates coma across the full photographic field without manipulating the focal length. The proprietory lens design has our Phantom Group™ wideband multicoating on all air to glass surfaces. This treatment delivers highest transmission combined with lowest amount of scatter and reflections across a very wide spectral range from UV to NIR. The original MPCC had been designed for an f/ratio of f4.5 to f6. The new Mark III however works exceptionally well even down to f3.5. Stars remain pinpoints across the field and the visual use likewise is made much easier - with the help of the 2" (M48) male filter thread at the eyepiece facing side. The base-element 2858400A is prepared for use with a DSLR and a standard T-ring, it can be used over the T-2 thread on all standard T-rings. Since the T-thread vignettes with cameras with larger sensors (such as full-format DSLRs), the T-2 thread can be removed. Then an M48 thread is free, and the free aperture increases from 38 to 44 mm. The M48 spacer ring for MPCC III / Protective EOS T-ring can be connected directly to the Protective CANON DSLR T-ring. This means that you do not only have sharp stars in the entire picture but also illuminate large sensors! In addition, the MPCC can be used both visually and photographically. The V-1 set # 2454803 contains the necessary adapters for most eyepieces or cameras with a 1.25 "socket - a detailed description can be found in the manual, which can be can be downloaded as a PDF under the tab "Downloads". The basic element of the MPCC can be upgraded at any time for visual use, all necessary parts are also available separately.